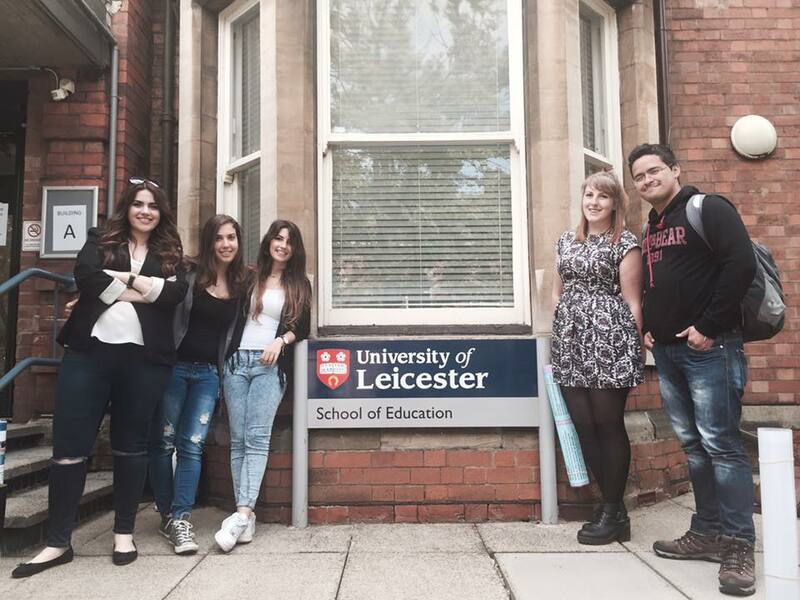 Yesterday was officially the last day of our MA TESOL course. No, we didn’t have any lectures nor seminars. It was something different. We had a mini-conference at Froser Noble Hall in the School of Education. The conference started at 9:45 am and ended at 1:15 pm. Each student had their own notice board where we placed our posters on it and people were walking around the room looking at our posters and asking us questions. This was part of my MA TESOL course as we were expected to produce an A2 poster where we presented our work that we did so far regarding our Professional Enquiry. You’re probably aware of what a dissertation is, well, Professional Enquiry or PE is something like that. It has the same structure and research work as a dissertation but the difference is that it’s more personal. At a PE you are expected to find a topic that interests you, do your research and collect your data but also to be able to reflect on what you found out. A PE is basically a piece of work that allows you to explore a certain area that interests you and reflect on it. For instance, you may choose to investigate how writing activities are taught at public schools in Greece and then from your research to be able to say that as a future language teacher you intend to use the knowledge you gain from it as well as how you would deal with such a situation yourself. The key is to choose a potential teaching context that you will most likely work there next year or at two years time maximum and then explore how you would be able to deal with all the struggles and limitations that you found from your research by creating a plan of action that will help you in your classroom. My PE topic explores the area of participation and willingness to communicate in the second language classroom. From my research I want to discover the reasons as to why some students choose not to participate in the classroom and what strategies the teacher could use to assist those students in order to create a social environment that would enhance learning in the classroom. From the mini-conference we were getting feedback from our classmates and our tutors as well as sharing ideas with each other. Along with our PE research project which is 12.000 words maximum we are then expected to submit a 1.000 word commentary based on the feedback that we got from the conference. I was extremely pleased from the feedback that I got for my poster as most of my tutors gave me positive comments and explained me how to continue my work with gathering my data. I also had the chance to share a few ideas with other classmates and have a look at everyone’s posters. After that we all went for food and drinks at a local pub where we sat next to our tutors and had a lovely chat. 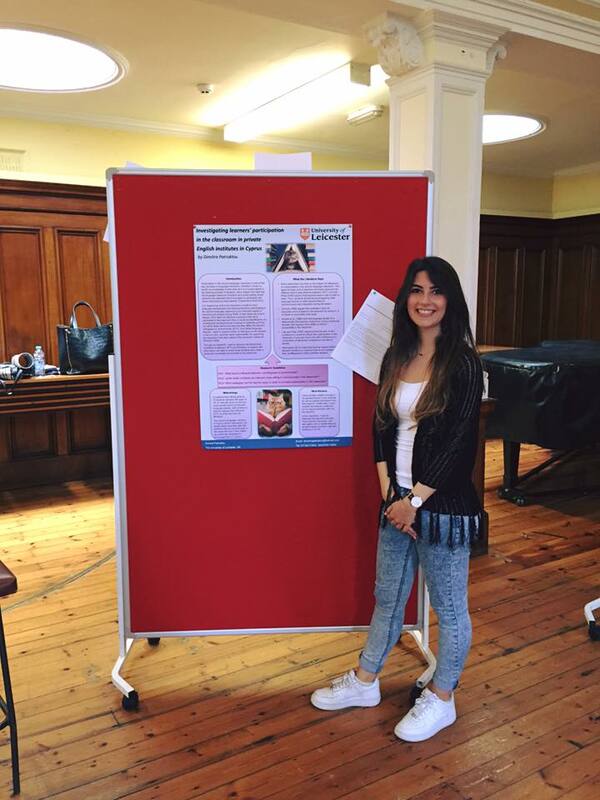 This is me posing in front of my poster after the conference was finished. And this is me with just a few of my classmates posing with the School of Education sign.